Mobile Marketing, alternatively also known as wireless marketing involves the usage of interactive wireless media to provide customers with time and location sensitive, personalized information that promotes goods, services and ideas, thereby generating value for all stakeholders. The use of mobile medium as a means of marketing communication has been creating buzz for quite some time now. With the phenomenal growth in tablet and smartphone sales (in 2012, more people purchased smartphones than PCs), every marketer worth his salt grasps the importance of mobile. In that perspective, what piques curiosity is whether this insight translates into action in terms of presence and breadth of mobile strategy, mobile ad spend growth and ROI tracked through mobile channels by companies and brands. Taking stock of a few relevant facts and figures leads us to some startling revelations. A measly 25% of brands claim to have a mobile strategy and some out of this sparse statistic incorrectly believe that simply having an app or a mobile-friendly website suffices for a strategy. 45% of companies are alien to the concept of wireless marketing, choosing to exhibit their content on desktop sites only. $22 billion has been spent on mobile advertising in 2012, compared to only $3 billion in 2010. 29% of mobile users are open to scanning a mobile tag that serves up instantaneously redeemable coupons and 30% of marketers are using mobile coupons. In fact couponing juggernaut Groupon was positioned to achieve 50% of its business from mobile by 2013. 42% of US consumers overall and 58% of smartphone users are aware of 2D barcodes. 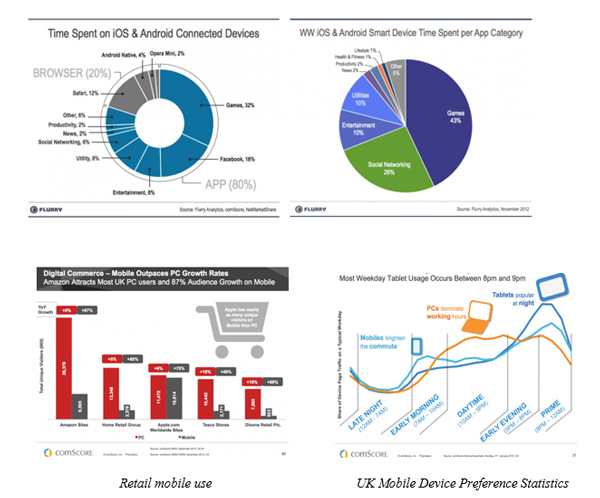 44.4% of all impressions are served on iOS-based devices, compared to 29% on Android devices. Adoption of iOS6 has continued to grow, now accounting for 65% of all iOS ad requests. Automotive brands took the lead in mobile in 2012, with the most innovative ad unit of the year delivered by Kia in the form of a tap-to-expand “Build a Car” ad unit that allows users to see various colors and 360-degree views. Thus consumers were served a more sophisticated mobile site with customization options, video content and car-shopping tools. Device Specific, as the name implies, pertains to the company developing specific website versions for individual devices such as smartphone, PC, tablet etc. whereas a Responsive Design is where the same website responds intuitively to separate devices customizing its layout and features accordingly. An interesting point to note here is, although “Responsive Design” clearly seems the design of choice and convenience, it may at times hurt Search Engine Optimization in cases where being responsive is not as beneficial as having a separate mobile site e.g. Disney’s Responsive site accessed by nearly 30,000 users per month who wind up there to play Disney games.Unfortunately, such games cannot be played on small screens resulting in poor experience and consequent quick bounce by mobile users that dents the site’s mobile SEO. For a marketeer, promoting apps on Google Play or Apple App Store poses a challenge due to the sheer volume of apps that are churned out regularly. The Apple App Store and Google Play have 700k apps each, two thirds of those apps have never been downloaded!! Download Rate: This parameter, at the very outset is indicative of how popular and engaging an app is. Install Base: A higher degree of installs for an app points to high level of consumer trust. 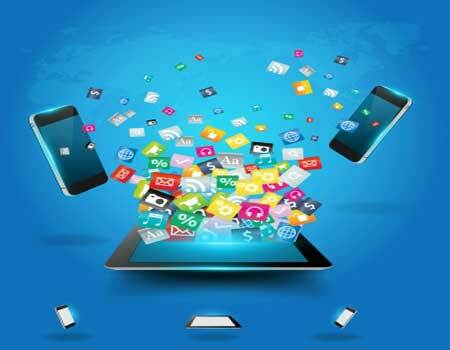 Social Mentions: Social Media in the form of Facebook, Twitter and blogs plays its role in providing social data to App stores to enable them to segment, describe and rank an app. Ratings/Comments: An integrated optimization strategy combined with positive reviews and good ratings can boost the app’s installation base, social popularity and online reputation. Originally, Apple’s Unique Device Identifier, or UDID, the 40-character alphanumeric string assigned to Apple devices - namely, the iPhone, iPad, and the iPod Touch was being used by App developers for mobile user tracking as it enabled mobile ad services to track and compile data tied to a particular device’s location, demographic information and user activity ranging from application use to m-commerce transactions. This quickly became mired in controversy over customer privacy infringement issues and led to the birth of the the new IDentifier For Advertisers, or IDFA, which launched in conjunction with iOS6. This allows advertisers and publishers to have more accurate frequency capping and post-click conversion tracking on mobile phones as also a medium of behavioral targeting in mobile without using personally identifiable information. The IDFA is not permanently tied to a particular device, allowing the user to reset it any point, or even opting out of ad tracking altogether using a “Limit Ad Tracking” feature.The ID also allows for better management of ad frequency, ensuring a particular device is only exposed to an ad a limited number of times. Since the new IDFA is only available on iOS6, users on previous OS versions will be missed in the tracking. However, iOS6 has a massive adoption rate of 93% as of 2013 that renders this apprehension baseless. Near field communication (NFC) is a set of standards for smartphones to establish radio communication by bringing them into close proximity. Communication is also possible between an NFC device and an unpowered NFC chip, called a "tag". An assortment of Tag barcodes, QR Codes, and other recognition technologies is now being used to link customers from all offline marketing materials to information, entertainment, and interactive experiences on their smartphones. These mobile interactions let people engage with a brand’s products and identify with the brand the moment they encounter the message. For example, Microsoft Tag marketing solution gives brands a vibrant suite of recognition technologies, from QR Codes to the current Tag barcodes and beyond to the next generation in mobile, Near Field Communication (NFC)..
Additional features include reports than can measure success of the marketing campaigns, and free download of the mobile app, the Tag app, that lets customers engage with the Microsoft Tag barcodes, and QR Codes. Campaigns can range from the simple: delivering a line of text or a phone number, or go further to help people browse the brand’s mobile site, see a video, download an app, get contact info, and much more on their smartphones. 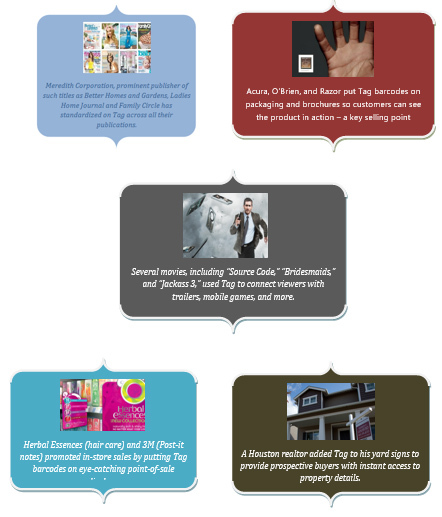 Marketers can update product brochures with a Tag barcode. Or use Real Time Location in a Tag to bring up search results showing nearby stores based on their customer’s location. Apple Passbook, a new feature that was released along with iOS6 and iPhone5, allows brands to push loyalty programs, gift cards, coupons and passes into a “delete proof” app for users with iPhone 4 or above. This may just be the next big thing in mobile marketing. The challenge for App developers is to focus on more geographically intuitive applications that sample data or draw a customer’s attention to what has been analyzed to be of their interest. This can be as simple as nudging a customer in the bread aisle at the grocery store to the need to fetch bagels. Or, it could tie into a loyalty program where a customer visiting the local hardware store, is auto-checked in and gets points/cash/coupons for each visit and/or purchase. Clearly, mobile is all set to revolutionize marketing.